This month we share the story of Sister Lillian Marie Brown whose advice of “don’t ever give up” comes from an assortment of personal and professional experiences…all, she now realizes, that were gifts from God. She was born on June 30, 1922, in Denver, CO – the daughter of Edward and Lilly (Morgan) Brown – and grew up among her seven siblings in a normal family existence. 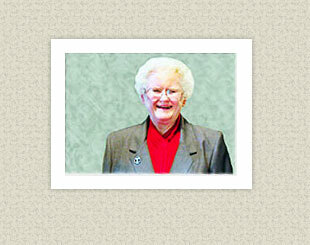 “We played together, prayed together, and worked hard,” Sister Lilllian Marie said. When asked if she could recall how her religious vocation originated, she quickly responded “From the time I was eight years old, I knew that I wanted to give myself to God.” She remained open that God would someday and somehow lead her. After working in several occupations after high school (including jobs as a salesperson, secretary, housekeeper, and laborer at an ammunition factory), she decided to act upon her curiosity about religious life. Seeing an advertisement from the Hospital Sisters of St. Francis and a Dominican Order in the Sacred Heart magazine was her motivation to write to both about her interest. “Soon after, I received a letter from the Hospital Sisters and was invited to visit Springfield. As for the Dominicans, I never heard back – that’s a definite sign from God,” she said with a laugh. She made her first profession of vows as a Hospital Sister of St. Francis on October 4, 1956. Throughout her life in this community, she has worked as a licensed practical nurse and a nurse aide, along with service in housekeeping and laundry. Prayer isn’t always about doing all the talking. It’s also about being quiet, for in those moments one can truly experience God – maybe even hear God. “From an early age, I learned that God is in your soul. In order to follow God, you must be willing to have faith, have trust, and be open to whatever may happen. I often think of the lyrics from the song ‘I never promised you a rose garden’ – how true is that message? In the end, we must remember that God will provide for us,” she concluded.